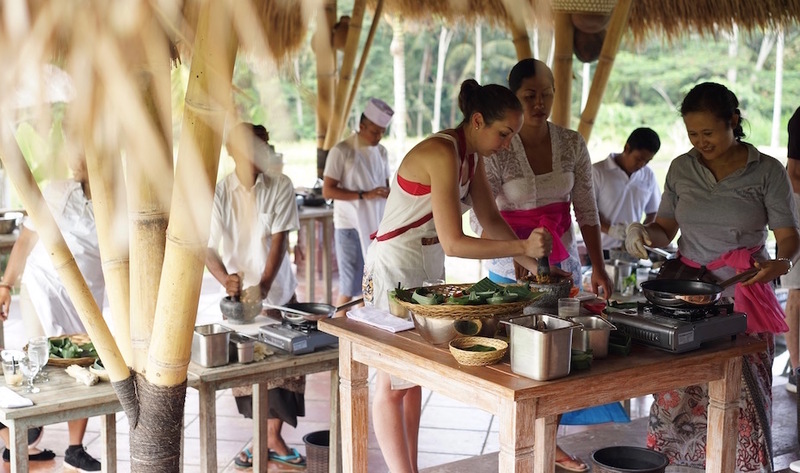 Bali’s Best Cooking Schools in Ubud, Seminyak, Canggu and beyond. Bali’s Best Cooking Schools: Spice up your sambal skills or nail a Nasi Goreng with a Balinese cooking class in Ubud, Seminyak, Canggu and beyond. Move aside, MasterChef. These cooking schools and classes in Bali let you take home the tricks of Indonesia’s culinary trade, with trips to the markets and spicy tips for the perfect sambal. 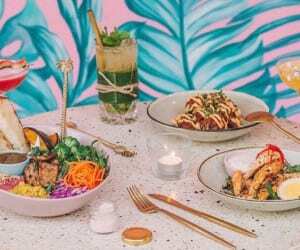 Besides the beaches, the dazzling sunsets, the glamorous resorts and jaw-droppingly beautiful landscapes, if there’s one thing we can’t live without in Bali, it’s Indonesian cuisine. Packed to the fragrant brim with herbs, spices, farm-fresh produce and generation-old recipes that can turn a simple handful of rice into a wide-eyed, lip-licking foodgasm, Indonesia’s home dishes are our absolute fave, and FYI, sambal separation anxiety is a real thing. Luckily for us, the island has become awash with cooking schools and classes to teach us the tricks of the trade. They offer everything from ingredient scouting to traditional preparation and must-try dishes, and even adventures to the local markets and across the luscious landscapes to give you a real taste of Bali [pun intended]. So to help you get your fix, here’s our pick of the island’s best. The Hujan Cooking Class: After all that bike riding, you’ll be waving your chefs hat at the infinity pool, breezy kitchen and scrummy Balinese feast! Put down that apron and wooden spoon [or at least, just for a few hours] because the Hujan Cooking Class from celeb street food chef Will Meyrick takes everything you know about a standard cooking class, throws it out of the kitchen window, puts you on a bike and sends you on an adventure through Bali’s most beautiful landscapes – all of that before cooking up a Balinese feast! You’ll scale the emerald green rice paddies, visit a stunning secret temple, ride beside the dark slopes of Bali’s slumbering volcanoes, meet smiling villagers and even scour the traditional markets for farm-fresh produce, before ending up back at Will’s casa [which just so happens to be the royal family of Bali’s own Puri Taman Sari Resort] for a cooking sesh like no other – infinity pool and five-star al fresco kitchen included! And with epic views all around, you’ll get to create some of Bali’s best dishes from Hujan Locale, like Ayam Betutu, Duck Satay and Karangasem Prawn Sambal – yum! You’ll even learn a thing or two about the ingredients whilst you’re at it [their health giving values and history within the region] before tucking into your scrumptious creations – poolside! The entire experience [from the pick-up service to the bike ride, temple tour, market visit and the full cooking class] costs just IDR 1,500,000 per person. The bee’s knees of Balinese cooking schools, this is about as luxurious as a cooking class will get in Bali. 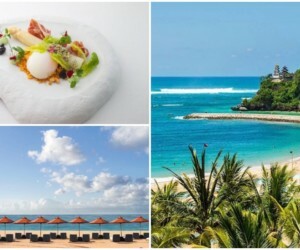 At the Four Seasons Resort Bali at Sayan, you can learn how to make traditional Balinese dishes such as chicken satay and grilled red snapper in banana leaf, all in the comforts of a super stylish five star hotel. The resort’s chef invites you to experience a hands-on approach [yup, that means you’ll be getting stuck in!] to learn about the exotic world of Balinese cooking. It begins at 8am [enough time for a lie-in] with either an escorted outing to the local market, or, if you prefer, the chef will take you on a tour of the resort gardens where they grow their own herbs, vegetables and spices. The tour is followed by an informative class at the Riverside Cafe, where you can tuck into some good foodie knowledge, or just fill your tummy with the scrumptious signature dishes. Four Seasons Resort Bali at Sayan, Jalan Raya Sayan, Ubud, p. +62 361 977 577. 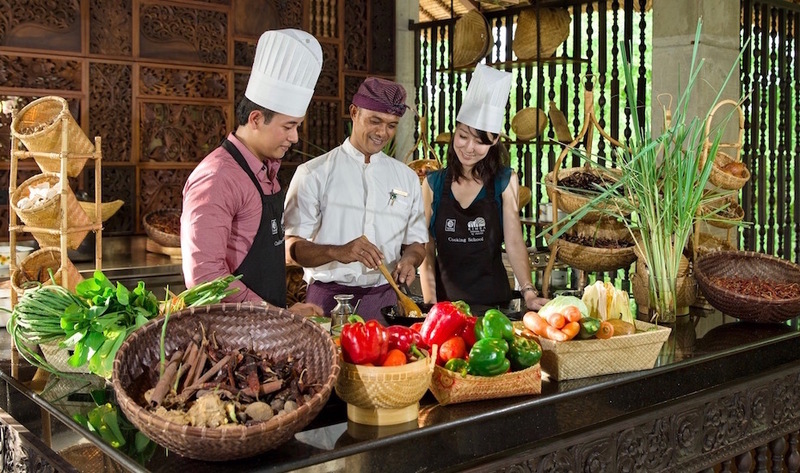 Iboe Soelastri’s Cooking Class at Hotel Tugu Bali: What year is it again? If you’re hellbent on learning about [and tasting!] 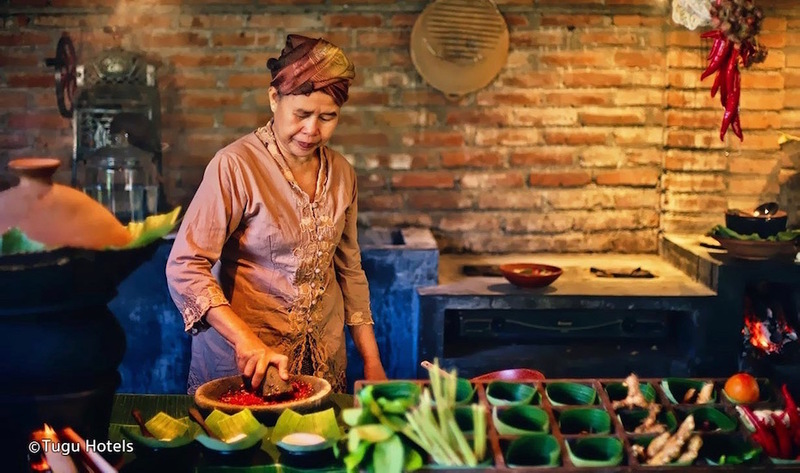 as many local ingredients, flavours and exotic spices as possible using age-old techniques and preparations from a bygone era, then Iboe Soelastri’s cooking class at Hotel Tugu Bali should definitely be on your culinary school shortlist. Like many of the island’s classes, the experience takes you to a traditional market, yet this itinerary takes you to Bali’s biggest: the enormous Badung market. Here, you’ll get a glimpse [and sniff] of the most vibrant, fragrant and bustling market vibes, before being whisked back to the Indonesian-inspired hotel for an immersive class that was initially curated by Iboe Soelastri herself, held in a classically-designed kitchen complete with wood-fired stoves, antique wooden furnishings and earthenware of old – you might even forget you’re cooking in the 21st century [just don’t forget to take a sambal selfie]! Scenography Cooking School at RIMBA Jimbaran BALI: By-standers need not apply, this is a hands-on culinary experience you’ll want to tuck into! If organic gardens, sustainable farming and unprocessed ingredients tickle your taste buds, then the Scenography Cooking School at RIMBA Jimbaran BALI is the cooking class for you. 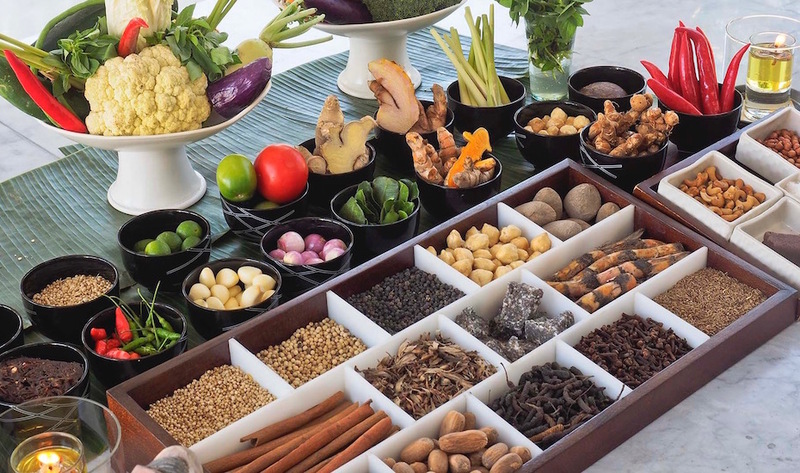 Bystanders need not apply, because this class invites you for a multi-sensory introduction to the basics of Bali’s unique cuisine, with hands-on experience of Bali’s exotic produce, including turmeric, lemongrass, palm sugar, chilli, and salam leaves – all the best bits! 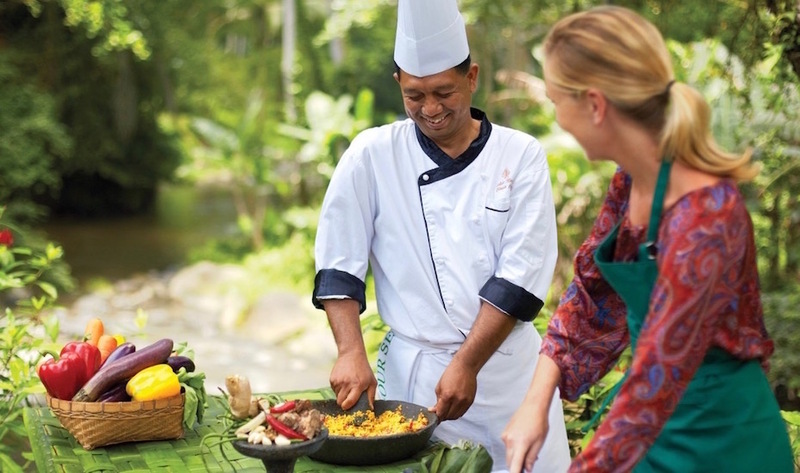 You can also choose from two culinary programs, one that includes an exploratory market tour and Balinese offering ceremony, or you can simply roll up your sleeves and get cooking in the middle of the resort’s vast gardens [90 hectares, no less]. And just in case all that cooking makes you sleepy, you might as well team your cooking class up with a few nights’ rest, because RIMBA has won countless awards as one of the world’s best resorts. The cooking classes are priced at 1,050,000 ++ per person for the cooking lesson only, or 1,150,000 ++ including the market tour. For those wanting to craft an entire – and totally traditional – adventure around the cooking school experience, Bali Asli is the perfect choice. 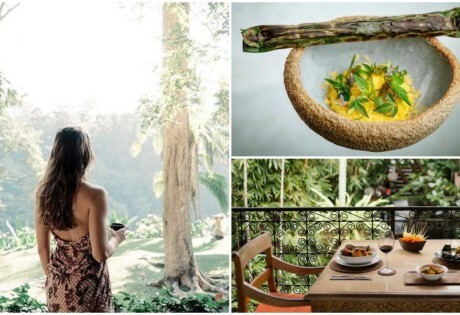 Located in the northeast village of Gelumpang, about 30 minutes from Candidasa or amazing Amed, Bali Asli is an all-encompassing culinary experience with the “A day in the life of a Balinese lady” program. From the crack of dawn, you’ll be hustling the morning produce markets and preparing flower offerings, hiking to Lempuyang temple to take in pandan forests, vanilla vines, and native orchids, and even learning a thing or two about fishing if you choose to join the “A day in the life of a Balinese fisherman” program. 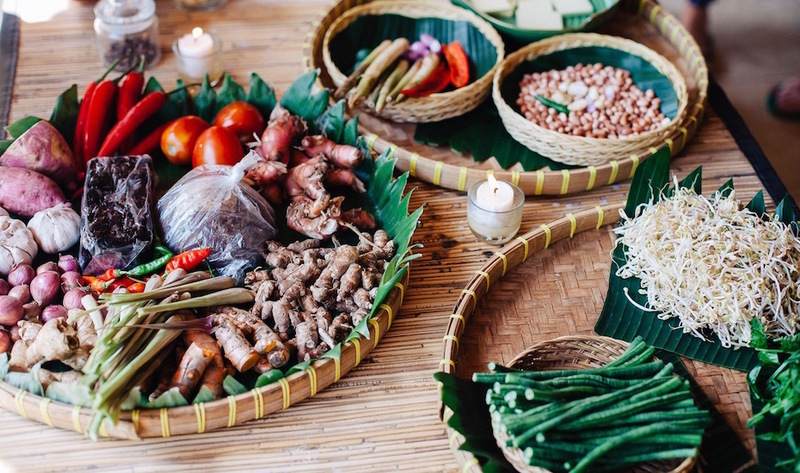 All of the programs come complete with certificates and recipes, and whichever experience you choose, experimenting with the likes of steamed young fern tips, bamboo and betel nut husks will see you leaving the cooking school endlessly inspired and armed with a new appreciation for Balinese culture and cuisine. Most programs will set you back just under IDR 1,000,000. Bali Asli, Jalan Raya Gelumpang, Gelumpang Village, RT. Amlapura, Bali, p. +62 (0)828 9703 0098. We could leave this recommendation at one name: Janet De Neefe. A respected Bali icon and the “Queen of Ubud”, Janet has been living in Bali with her husband Ketut Suardana for over 30 years. She founded the world-famous Ubud Food Festival, has released both a cookbook and a memoir, and owns many of Ubud’s hospitality hotspots – Casa Luna, Indus, Bar Luna, Honeymoon Bakery, Honeymoon Guesthouses, and The Emporium. 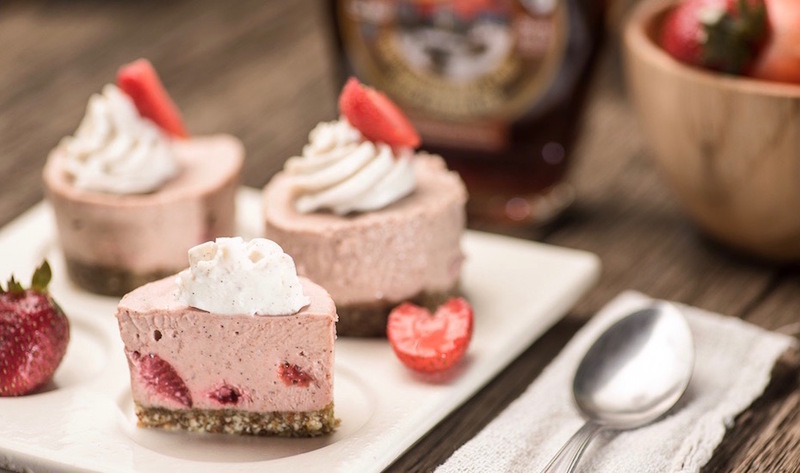 The Casa Luna Cooking School is just one part of their very delicious pie. Listed as “amongst the world’s best cooking schools” in The Australian newspaper, check out their weekly schedule including a twilight smoked duck class and a vegetarian food as medicine class. Intrigued? We are too! Casa Luna Cooking School, Jalan Bisma, Ubud, Bali, p. +62 361 973 282, e.cookingschool@casalunabali.com. Paon Bali: The rave reviews online say all you need to know about this popular class! 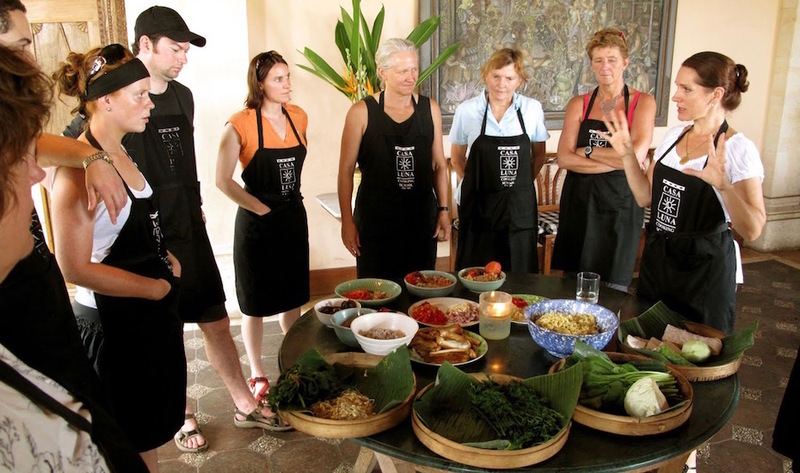 Arguably one of the most well known food-meets-culture experiences on the island, Paon Bali offers classes that are as much about getting to know village life as they are about food. With a choice of vegetarian or meat classes, and the chance to learn the process of making coconut oil, Paon Bali is not to be missed. They offer a morning class at 8am and an afternoon class at 4pm, both from Rp 350,000 per person. And if you’re not sure if it’s the right one for you, just check out the flood of online praise and don’t be surprised if you read “the best cooking class EVER” – more than once. Paon Bali, Laplapan Village, Ubud Gianyar, Bali, 80571, Indonesia, p. +62 81 337 939095. The Balé Nusa Dua – Bali: You’ll not only leave with the culinary skills to wow an entire Balinese village, you’ll also gain a new BFF! We all like to feel a little bit special sometimes, especially when we’re not too sure which way up the chef’s knife should be. 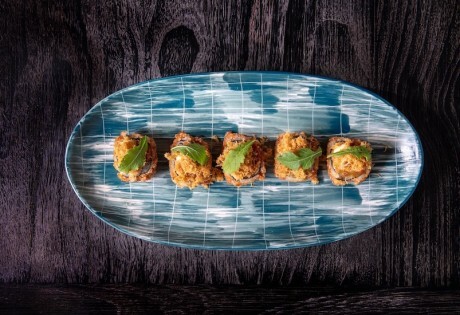 So to help you settle into your luxe cooking class at The Balé Nusa Dua – Bali, the thoughtful chef goes out of his way to make you feel like his bestie, all the while sharing the secrets of whipping up a Balinese masterpiece. The class begins with a very personal welcome from the chef himself before he escorts you through the local vegetable and fish markets to source the ingredients for your epic lunch. A few slices here, a bit of frying there, a sprinkle of some farm-fresh herbs and spices, and voila! Your feast is served, before your new chef chum bestows you with your own certificate and a personalised gift – adorable! The class is held from Monday thru Sunday and costs IDR 950,000++ per person for two hours of personalised deliciousness! Bumbu Bali’s cooking class is the OG of the island’s culinary schools – it’s been around for yonks and continues to be a favourite for Bali’s regulars. And we love it because you start the day early by getting down and dirty at the local markets. It kicks off at 6am in Tanjung Benoa where you’ll be wowed by your guide’s comprehensive introduction to the exotic ingredients and unique culinary heritage of Bali. You’ll then hit the beach where local fisherman will be divvying up their morning catch straight from the ocean, you’ll fill up on a big Balinese breakfast, then take to the kitchen dressed in full chef attire ready to learn the secrets of 20 traditional Balinese recipes, all under the guidance of Heinz von Holzen who has written five books on Balinese and Indonesian cuisine. You can’t argue with that! Did we mention the black rice pudding and that lunch is an absolute feast? This 9-hour activity takes place on Mondays, Wednesdays and Fridays and costs USD95.00++ with the market visit or USD85.00+ without. Bumbu Bali, Jl. Pramata, Tanjung Benoa, Kuta Sel., Bali, p. +62 361 774502. 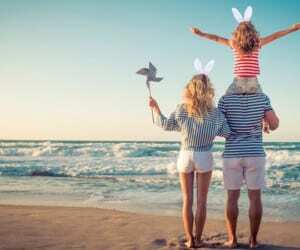 The Breezes Bali Resort & Spa Cooking Class: Grab the fam and get cooking – poolside! Poolside views in the comfort of The Breezes Bali Resort & Spa? Tick. Authentic Balinese chef with easy-to-follow recipes? Tick. Suitable for the whole family with delicious food to boot? Double tick! 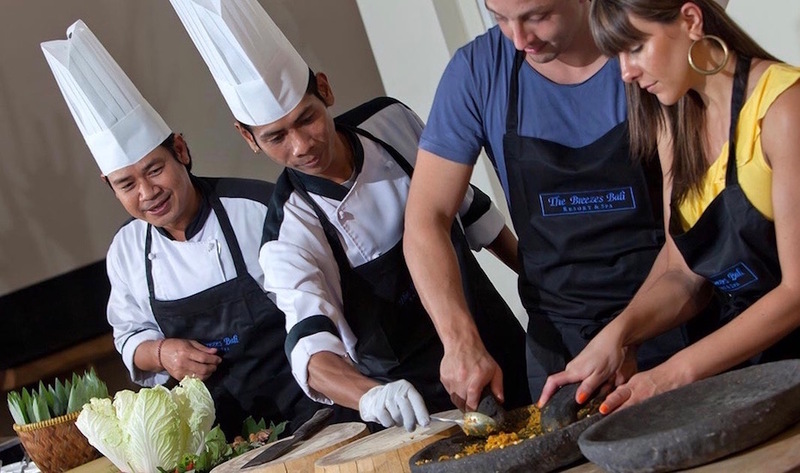 The cooking class at The Breezes Bali Resort & Spa is one of our all-time faves, not just for the fact that the majority of the chopping has already been done for you [trust us, there’s a LOT to chop otherwise!] but also because the class is great for the whole fam to get stuck into. First you’ll get a go at chopping, slicing and dicing, before learning how to make the unique Balinese “bumbu” paste that all signature dishes are made from. You’ll cook seven different dishes in total, including a starter, main and sweet dessert, before enjoying your masterpieces beside the pool. And if that wasn’t enough, you’ll even be given the recipe book to take home with you, because we all know that after a few too many cocktails at the pool bar, remembering when to add coconut here and turmeric there becomes a little hazy! The cooking class is available every day and costs IDR 350.000++ per person. And be sure to book at least 48 hours in advance so you don’t miss out on taking home some Balinese culture. Get your chef’s hat at the ready! If you don’t fancy being tied to the confines of the kitchen, take the chef party outdoors and journey to east Bali’s quaint hillside village of Sideman and find yourself in Green Kitchen. Walk through rice fields, swim in rock pools and frolic through their organic garden. All this in 5-hours, complete with your self-cooked sure-to-be-delicious lunch. All cooking is done on firewood, making this one of the most authentic cooking classes around, not to mention the most outdoorsy. Green Kitchen, Sidemen, Karangasem, Bali. e. malalibali@yahoo.com, p. +6282 146 060 236. If it’s value for money you’re after, Lobong Culinary Experience’s IDR 425,000 cooking lesson is everything you are looking for. Located just north of Ubud, this tranquil mountain setting is perfect for exploring Balinese food, even welcoming you into the home of your cooking host to really get a feel for Balinese living. You’ll check out a market, learn some kitchen skills, munch away in the outdoor cooking pavilion, before saying farewell [or selamat jalan] to the Lobong family. The price even includes a “terima kasih” parting gift, too – cute much? Lobong Culinary Experience Bali, Jalan Raya Kedewatan, Ubud – Gianyar,p. +62 81 236 51 778. Living Food Lab: Raw chocolate and no cooking required? You had us at hello! 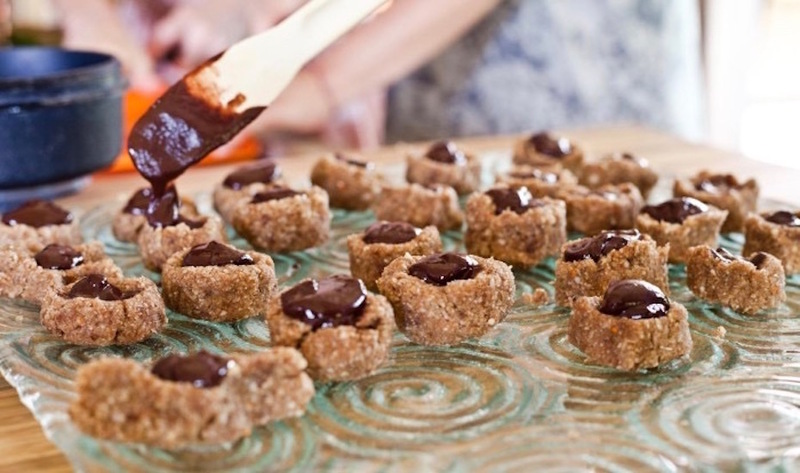 Raw, vegan, organic, gluten free: all the buzzwords are alive and kicking at Living Food Lab. They offer all-age classes at their Green School café every Saturday; certified courses through their living food academy; private classes for families, friends or solo chefs; and there’s even talk of online courses in the future for anyone who can’t make it to Bali. 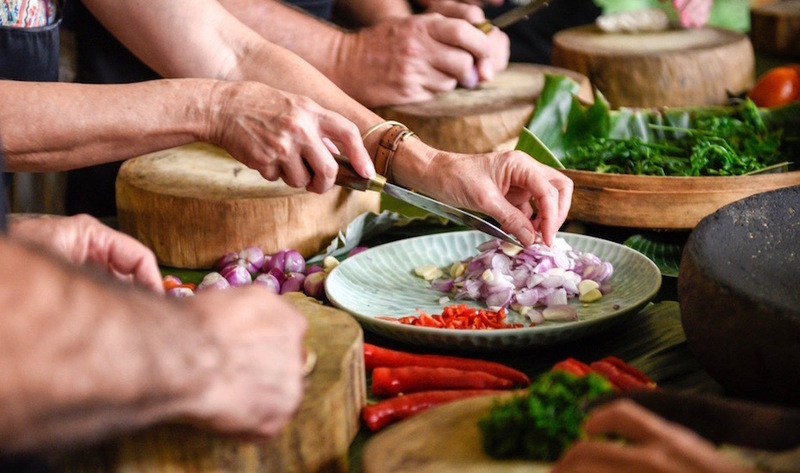 Though there’s no actual cooking as such, these Living Food Lab classes are an introduction to the whys and how to’s of raw, plant-based food preparation, with the same outcome as any other cooking class: finger licking good fun for all ages! Did we mention there’s raw chocolate, too? Living Food Lab, Jalan Raya Sibang Kaja, Banjar Saren, Abiansemal,p. +62 821 4668 9916. Let’s take a moment to think sympathetic thoughts for all those people who come to Bali and think avoiding sickness means avoiding raw foods. What a rainbow of culinary delights they are missing out on! 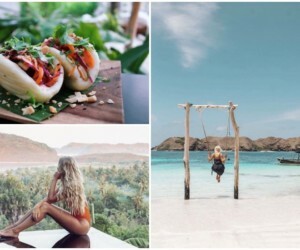 Bali is in fact one of the greatest places on earth to tap into the incredible new world of raw foods, in which fresh salads are just a tiny part of the picture, overshadowed by delicious cakes, lasagnas, breads and more. So to combat the misconception, Raw Food Bali offers 3-hour workshops amongst the jungles of Ubud, offering everything from a course in the fundamentals to a dedicated durian workshop. Classes start from US$80 per person, can be customised to suit the needs of your group, and include a nutritional lecture to boot. Raw Food Bali, p. +62 8781 260 2266 / +9 609 627 209 [WhatsApp/Viber] e. rawfoodbali@gmail.com. So what are you waiting for, Honeys? Grab the girls, pop on that chef’s hat and we’ll see you in the kitchen! 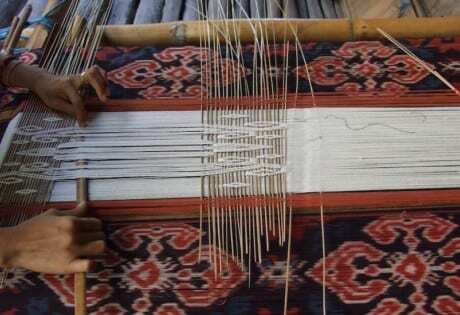 Looking for traditional textiles in Bali?